Posted on Gennaio 29, 2017 by fanarhotel wrote in Notizie, Uncategorized. 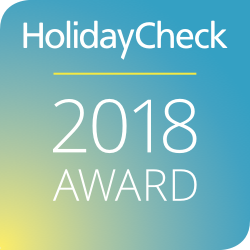 HolidayCheck is delighted to honor Fanar Hotel and Residences with HolidayCheck Award 2018. Winning the HolidayCheck Award 2018 is a true source of pride for the entire team at Fanar Hotel and Residences, we’d like to thank all of our past guests who chose Fanar Hotel and Residences as one of the most popular hotels on HolidayCheck.